Ten-man Hamilton Accies fought back to earn a point against Partick Thistle, after Lucas Tagliapietra was sent off just before the interval. Thistle, seeking a third straight win, took the lead through Mathias Pogba. The visitors were always dangerous despite their one-man deficit, though, and experienced Dougie Imrie pounced on a lax home defence to level. And only a fine late save from Thistle substitute goalkeeper Ryan Scully denied Grant Gillespie a winner. There was a tentative start made by both sides, and the first real chance fell the way of the hosts. Pogba found Ryan Edwards wide on the left and his deep cross was volleyed high and wide by David Amoo. At the other end Imrie tried his luck from 25 yards, but the seasoned Accies winger was wide of the target. The visitors were willing to shoot on sight around the edge of the box early on, and while Greg Docherty knocked a volley over the bar, Antons Kurakins sent a left-foot strike wide of the post and Gramoz Kurtaj saw his effort parried away by Tomas Cerny. Thistle had a great chance to make the breakthrough but Steven Lawless managed to send a header from a Callum Booth cross over the bar from six yards. The hosts then had to replace Cerny with Scully on the half hour mark, after the keeper seemed to suffer an injury as he dispatched a long clearance. Amoo wasted an another opportunity just before the interval when he dallied on the ball instead of shooting. In stoppage time at the end of the first half Accies were reduced to ten men after Tagliapietra was red carded by referee Euan Anderson for pulling back Amoo. The Accies defender took a poor touch 23 yards out and then made sure Amoo was going no further as he looked to take advantage of the mistake. With an hour gone, Thistle broke the deadlock, Pogba tapping home Amoo's cross from close range to notch his first goal for the club. Accies player/manager Martin Canning decided he needed to put himself into the action to assist his defence and replaced Greg Docherty. Despite having inferior numbers Accies were still a major threat with the probing combination of Imrie and Kurtaj always creative. And it was no surprise when Imrie got in behind the Thistle defence to equalise 12 minutes from the end, ensuring four of the last five meetings between these sides have finished all-square. Match ends, Partick Thistle 1, Hamilton Academical 1. Second Half ends, Partick Thistle 1, Hamilton Academical 1. Attempt missed. Robbie Muirhead (Partick Thistle) header from the centre of the box is too high. Attempt missed. Kris Doolan (Partick Thistle) left footed shot from outside the box misses to the right. Substitution, Hamilton Academical. Alejandro D'Acol replaces Louis Longridge. Attempt missed. Robbie Muirhead (Partick Thistle) header from the centre of the box is high and wide to the left. Robbie Muirhead (Partick Thistle) is shown the yellow card. Substitution, Partick Thistle. Kris Doolan replaces Mathias Pogba. Attempt blocked. Gramoz Kurtaj (Hamilton Academical) right footed shot from outside the box is blocked. Attempt saved. Grant Gillespie (Hamilton Academical) right footed shot from outside the box is saved in the bottom right corner. Attempt missed. Jesus Garcia Tena (Hamilton Academical) header from the right side of the six yard box is too high following a corner. Corner, Hamilton Academical. Conceded by Sean Welsh. Attempt blocked. Ziggy Gordon (Hamilton Academical) right footed shot from outside the box is blocked. Foul by Steven Lawless (Partick Thistle). Goal! Partick Thistle 1, Hamilton Academical 1. Dougie Imrie (Hamilton Academical) left footed shot from the left side of the box to the bottom right corner. Assisted by Gramoz Kurtaj. Attempt missed. Dougie Imrie (Hamilton Academical) left footed shot from outside the box is too high. Substitution, Hamilton Academical. Christian Nade replaces Carlton Morris. Attempt missed. Robbie Muirhead (Partick Thistle) left footed shot from outside the box misses to the right. Attempt blocked. Grant Gillespie (Hamilton Academical) left footed shot from outside the box is blocked. Stuart Bannigan (Partick Thistle) wins a free kick in the attacking half. Corner, Hamilton Academical. Conceded by Stuart Bannigan. Corner, Hamilton Academical. Conceded by David Amoo. Attempt saved. Carlton Morris (Hamilton Academical) left footed shot from outside the box is saved in the bottom right corner. Substitution, Hamilton Academical. Martin Canning replaces Greg Docherty. Goal! Partick Thistle 1, Hamilton Academical 0. 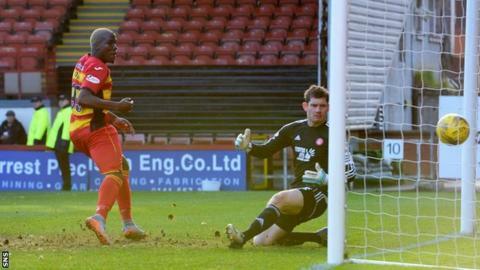 Mathias Pogba (Partick Thistle) right footed shot from very close range to the bottom right corner. Assisted by David Amoo. Attempt saved. Robbie Muirhead (Partick Thistle) right footed shot from the right side of the box is saved in the centre of the goal. Attempt missed. Steven Lawless (Partick Thistle) left footed shot from outside the box is high and wide to the right. Attempt missed. Steven Lawless (Partick Thistle) left footed shot from outside the box is too high following a corner. Corner, Partick Thistle. Conceded by Greg Docherty. Substitution, Partick Thistle. Robbie Muirhead replaces Ryan Edwards. Corner, Partick Thistle. Conceded by Jesus Garcia Tena. Attempt missed. Dougie Imrie (Hamilton Academical) right footed shot from outside the box is close, but misses the top left corner. Second Half begins Partick Thistle 0, Hamilton Academical 0. First Half ends, Partick Thistle 0, Hamilton Academical 0.